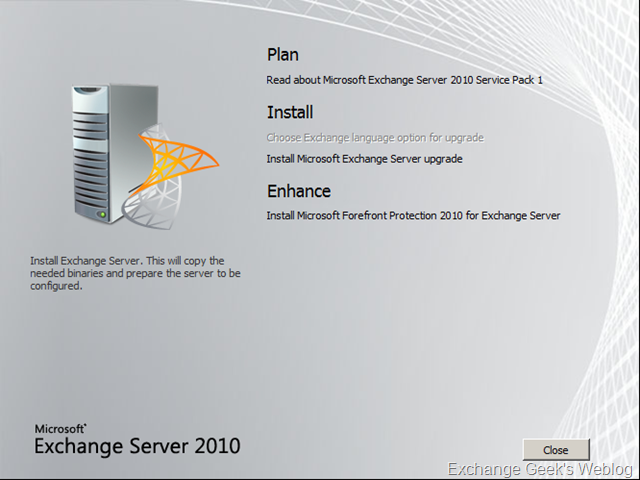 Microsoft released another feature packed exchange update for exchange 2010. The service pack 1 (beta) for exchange 2010 contains many newly added features and fixes to identified bugs. 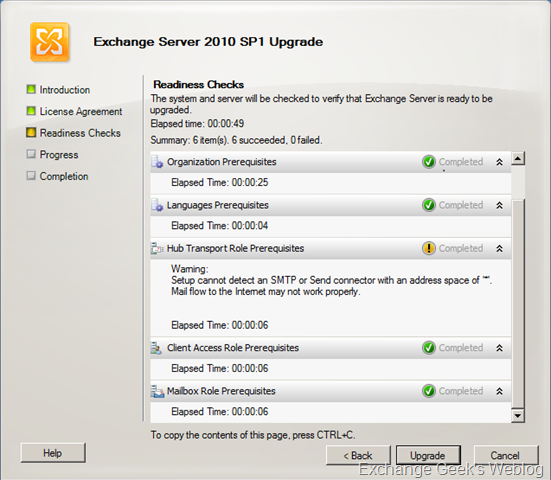 Installing SP1 on a standalone exchange 2010 server is not a very big deal but when it comes to applying an update or service pack on clustered servers exchange always needed a special procedure. This blog post discusses the steps that you need to follow while installing service pack 1 on a server which is a part of a DAG. Identify which server you want to update first. This is normally a server which hosts only passive copies of databases. You may also have a situation where all DAG members host at least one active copy of any database. In such situations follow the next step. This step can be skipped in future if MS comes with some solution and consolidates the hotfix in exchange installer itself. Download and install hotfix KB981002. This hotfix requires a system reboot. :-). Another hotfix required for the OS is http://www.microsoft.com/downloads/details.aspx?FamilyId=87f72529-d316-42e8-bf77-a46951f66dda&displaylang=en. This can be downloaded when you run windows update. If you have run windows update lately then it is not required. Once you have identified the server where you want to update first; suspend activation for the database copies on the server being updated. Get-MailboxDatabaseCopyStatus -Server E1402 | Suspend-MailboxDatabaseCopy -ActivationOnly -Confirm:$False -SuspendComment "Install SP1 for Exchange 2010"
E1402 is my server name in the DAG you must replace it with your server name. Then the next step is to switch over the server being updated to another server. To switch over the server open EMC and locate the server being updated under Server Configuration –> Mailbox. Close all MMC instances open on the server including EMC. Select the languages to be installed and click on Install Microsoft Exchange Server Upgrade link on the page. After you accept the license agreement installer runs a BPA check as usual. Now you are ready to upgrade. You may not see that warning abut SMTP send connector if you have it configured correctly. Here you can see that the SP1 is going through the Org Preparation one more time. You can read about the AD changed SP1 makes here. It is important that you review these changes as your organization may have custom schema extensions depending on the existing exchange 2010 schema extensions. You can also perform the database switchovers as necessary using EMC after this. And simply repeat these steps for all other servers in the DAG. Please note: It is highly recommended that you perform the backup of your AD servers before applying Exchange Service Packs. This entry was posted on 11/06/2010 at 5:24 PM	and is filed under Exchange 2010, Setup. You can follow any responses to this entry through the RSS 2.0 feed. Both comments and pings are currently closed. Correct me if I’m wrong but you missed a step. You stopped the server from activating databases but you didn’t actually perform a switchover. You should also have the following. I scrolled to fast. I see you did that with the EMC. My apologizes.